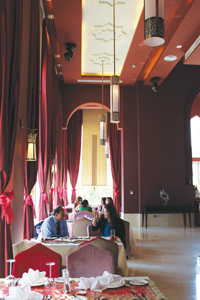 Al Areen Palace & Spa, one of Bahrain’s premier villa-styled hotels, has relaunched its Arabic restaurant, now named Saffron-Al Areen Khaleeji Cuisine. The outlet features a high ceiling with Middle Eastern finished interiors and overlooking the relaxing view of the hotel’s majestic outdoor pool. This new signature dining venue introduces a new array of menu inspired by Bahraini dishes blended with European and Khaleeji fusion. The a-la-carte menu showcases an array of starters such as mezza, nakhi or spicy cold gazpachos plus combination of different fresh salad delights and selections of richly-flavoured soups such as the famous harees or jareesh and lamb soup. For main course guests can enjoy a delectable selection of food choices from hammour machbous, mutabak zubaidi to lamb thareed or grilled dishes such as hammour tikka or lamb leyash. The dessert section features Bahrain’s favourite desserts such as khanfaroosh, bathetha and popular dish um ali. Saffron–Al Areen restaurant is the first of many other upscale dining venues that will be launched in the five-star property in the upcoming months. With new refurbishments and creative upgrading of its facilities, Al Areen Palace & Spa is looking into a brighter future making the hotel one of Bahrain’s top destinations in providing world-class comfort and dining experience.